Home » Where Did It All Go Wrong For Spain? Where Did It All Go Wrong For Spain? The Spanish sporting media loves a winner but cannot wait to stick the knife into a loser. There is no middle ground with the sports media in Spain, you are a hero or you are a zero and the Spanish basketball side must be feeling as low as you can get at the moment. The fact that the papers and online media in the host nation of the 2014 FIBA Basketball World Cup genuinely believed that they were favourites for the tournament, they weren’t just being polite or talking up their chances, indicates the frenzies approach to sports reporting in Spain. This means that there won’t be much time for quiet recollection of the failure against France, the team has already been hung out to dry like some of the tastiest Spanish ham. The French team stood up to be counted and even with some top names missing, they found a new leader in Boris Diaw, who delivered 15 points, 3 assists and 5 rebounds which cajoled his team-mates into action. There was also a strong defensive showing from Rudy Gobert, grabbing 13 rebounds and knocking the Spanish off their stride. The fact that Spain’s tally was 36 points lower than their average for the tournament up until this point indicated how strong France were in defence. 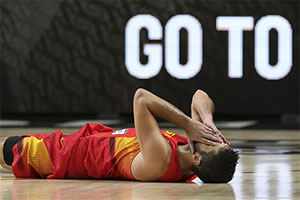 Yes, Pau Gasol had his usual strong showing but there was no support or back-up for him as Spain wilted under the expectation of the home crowd. Marc Gasol and Serge Ibaka, two big NBA players, only managed to add 5 points between them. Did Spain underestimate their bitter rivals? Already discussions have taken place as to what went wrong for Spain and it seems as though Spain underestimated France, which is something you can never do against a bitter rival. In their minds, the Spanish players were probably calculating ways to take down the American side but in their rush to play the final, they forgot about making sure they booked their passage through to the end of the campaign. The fact that they failed before the semi-final stage, missing out on a medal, was particularly damning for the Spanish fans and media, with the repercussions from this failure expected to last a long time. There will be some fans believing that this will diminish whatever Team USA achieves at this tournament even further, and yes, it would be fair to say that of the top seeds, the American side had the slightly easier bracket. Then again, Spain had already convincingly dismissed France in the group stages, so it was not as if they were coming up against an opponent they should have struggled against. There is no doubt, especially for many in the host nation, the FIBA World Cup will limp to the line now but surely these upsets are what makes sporting events come alive? Team USA are in the final with France and Serbia still battling away to reach there and there is no guarantee that the Spanish conquerors will make the final. In fact, the bookmakers make Serbia the favourite in the semi-final, so France may have to settle for a third and fourth match against Lithuania. There is still a lot of joy to take from the 2014 FIBA World Cup, but for the host nation, the event is going to leave a bitter aftertaste in the mouth.